Masonry system 2 is a rainscreen wall system with steel-framed wall structure and anchored masonry veneer. The typical components of this system, from interior to exterior, are described below in Fig. 2-1. This system is appropriate for many applications including low-, mid-, or high-rise residential or commercial buildings. An example project application of this system is shown in Fig. 2-2 on page 2-2. Fig. 2-1 Typical System 2 components from interior to exterior. The water control layer, comprising the water-resistive barrier (WRB) system. The air control layer, comprising the air barrier system. The thermal control layer, comprising thermal insulation and other low- conductivity materials. The vapor control layer, comprising vapor retarding materials. Fig. 2-3 illustrates the water-shedding surface and control layer locations for this system. The water-shedding surface and control layers for typical system details are also provided adjacent to each detail at the end of this chapter. As shown in Fig. 2-3, the water-shedding surface is located at the anchored masonry veneer, with most water-shedding occurring at the wall face while some water will be stored within the masonry veneer to be released at a later time. 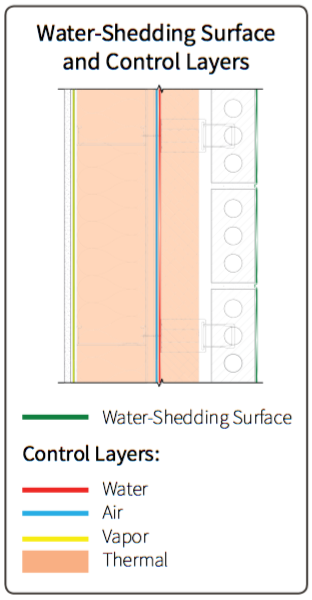 The water control layer and the air control layer occur at the same location exterior of the wall sheathing. The thermal control layer occurs at the framed wall cavity insulation and exterior insulation. The vapor control layer occurs at the interior (warm-in-winter side) of the steel-framed structure. The water-shedding surface reduces the water load on the enclosure. A general discussion of the water shedding surface is provided in the Water-Shedding Surface discussion on page i-19. The anchored masonry veneer cladding, including both mortar joints and masonry veneer units, is the primary water-shedding surface of the wall system. Additional water-shedding surface components within the wall system include sheet-metal flashings, drip edges, sealant joints, and fenestration systems as shown in the details at the end of this chapter. To promote water shedding at the masonry veneer face, install mortar joints with a tooled concave (preferred) or “V” shape. Class IV vapor permeance properties regardless of the insulation R-value placed within the wall cavity relative to the insulation placed exterior of the air barrier and WRB system. Class I and II vapor permeance properties when at least 1/2 to 2/3 the total nominal insulation R-value of the wall system is placed exterior of the air barrier and WRB system. For this case, the air barrier and WRB system will also function as the vapor control layer. As a result, a separate vapor retarder membrane (as shown typical on page 1 of this chapter at the interior side of the framing) may be omitted. Class III vapor permeance properties when carefully evaluated against other system material properties and the thermal control layer. Physical properties of the WRB system products, are discussed in detail in the Water Control Layer discussion on page i-24. Vapor permeability of materials is addressed in the Vapor Control Layer discussion on page i-28. The air barrier and WRB system must be continuous across the wall system to provide effective water control. In addition to the field membrane, the WRB system includes fluid-applied or self-adhered flashing membranes, sealants, sheet- metal flashings, and penetrations such as windows and doors as shown in the detail drawings that follow this chapter discussion. 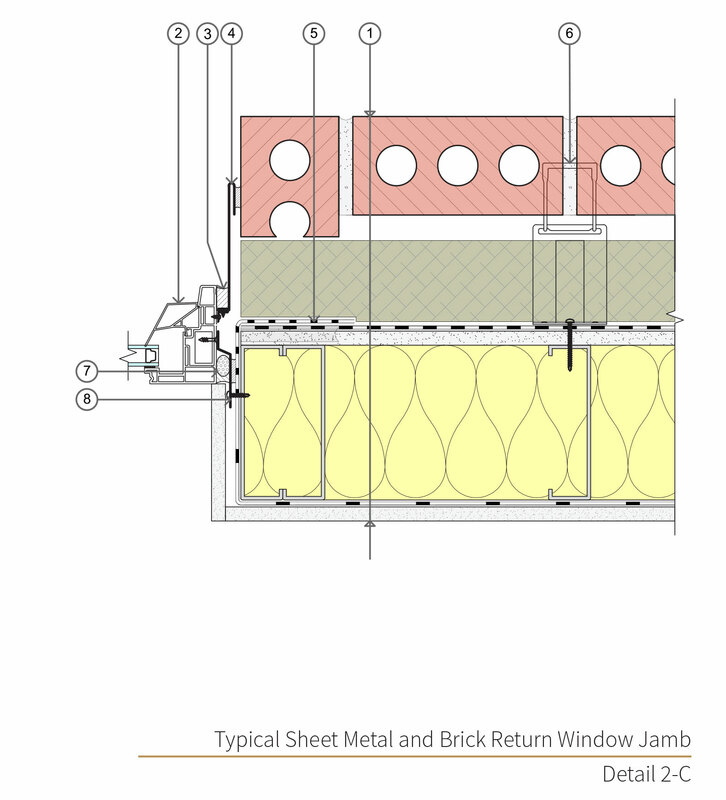 Where sheet-metal flashing components occur within the system, the back leg of the sheet-metal flashing is shingle-lapped into the WRB system to facilitate drainage at the face of the WRB system and to the exterior of the cladding. The air barrier system serves as the air control layer. In addition to controlling air, this layer also assists with controlling liquid water, heat, and water vapor. For this wall system, the air barrier system consists of the same field membrane and many of the components that also serve as the WRB system. A general discussion of the air control layer and the air barrier system is provided in the Air Control Layer discussion on page i-26. As discussed in the Introduction, the air barrier system must be continuous and fully sealed to resist air flow, whereas the WRB system need not be continuously sealed to be effective, merely shingle lapped. 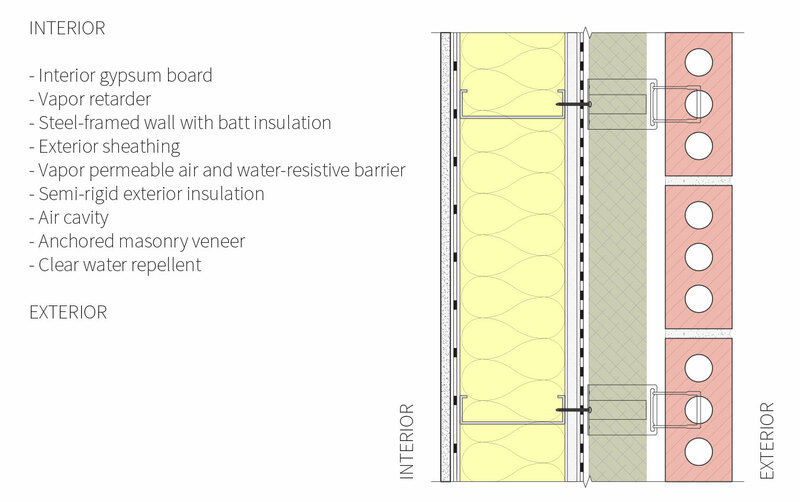 When a Class IV permeance air barrier and WRB system is used within this wall system, typically a vapor retarder (Class II) is located at the face of or just behind the interior gypsum board. The vapor retarder for this system should comply with Section 1405.3 of the governing International Building Code (IBC).1 In the Northwest, typical vapor retarder products include PVA vapor-retarding primer, asphalt-coated kraft paper, or a polyamide film retarder membrane. Refer to the Vapor Control Layer discussion on page i-28 for additional information. 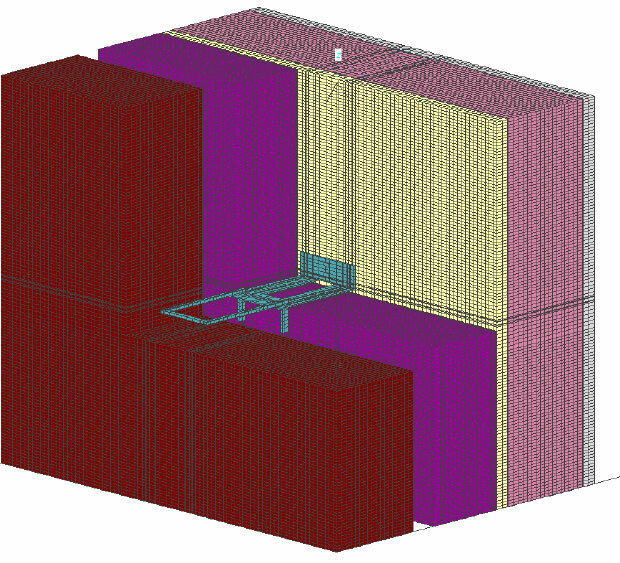 When a Class I or II permeance air barrier and WRB system is used within this wall system, the WRB system becomes the vapor control layer and a separate vapor control layer (as shown in Fig. 2-1) is not necessary. 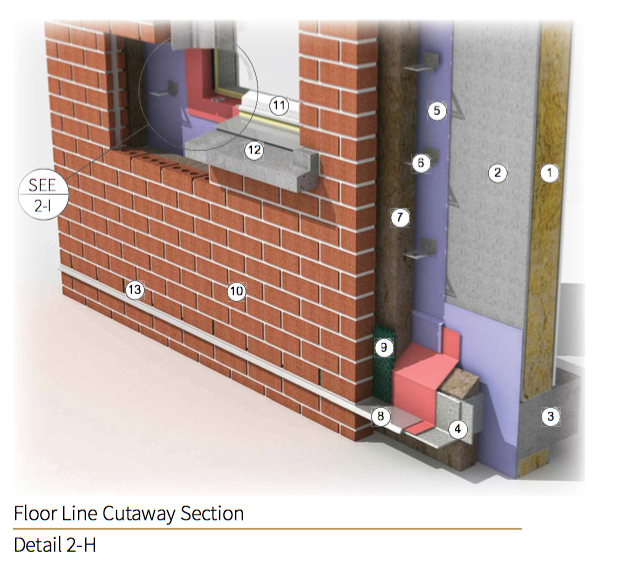 Note that in this case, the thermal insulation R-value within the framed wall cavity is recommended by this guide to be 1/2 to 1/3 the total nominal insulation R-value of the wall system. 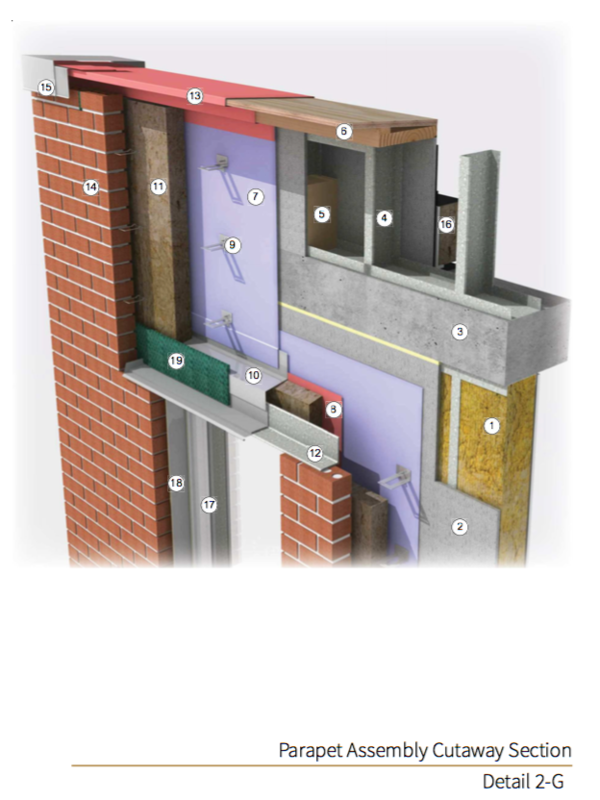 In this wall system, the framed cavity and exterior insulation are the primary materials that form the thermal control layer. At transition details the thermal control layer also includes exterior insulation across floor lines; parapet cavity insulation; and insulation at the roof assembly, slab, and foundation elements. Windows and doors that penetrate this system are also part of the thermal control layer. Additional thermal control layers information is provided in the Thermal Control Layer discussion on page i-30 of the introductory chapter. The cavity insulation in this system is insulation product. 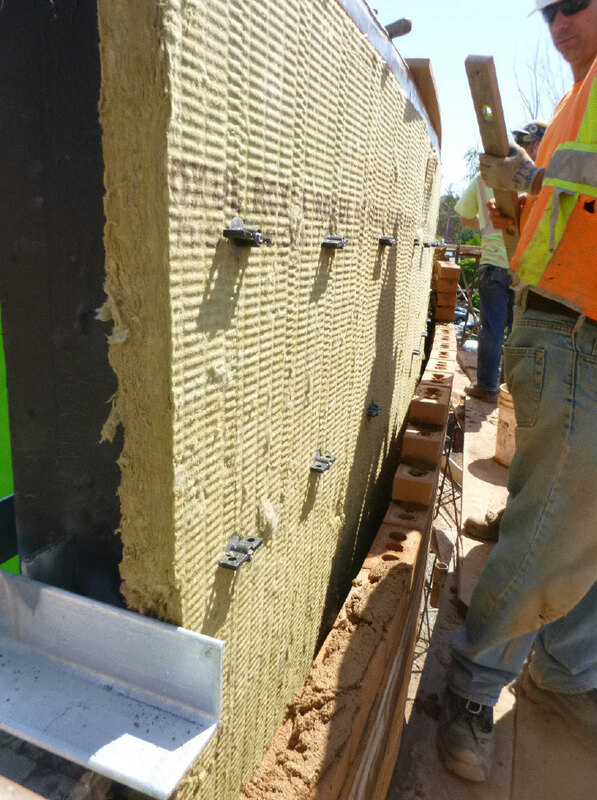 The exterior insulation in this wall system is typically semi-rigid mineral fiber board insulation (R-4.2/inch)—which is hydrophobic, tolerates moisture, and has free- draining capabilities. Its vapor permeance makes it acceptable for use exterior of a high-permanence air barrier and WRB system without inhibiting assembly drying. An example of this insulation is shown in Fig. 2-5 on page 2-6. 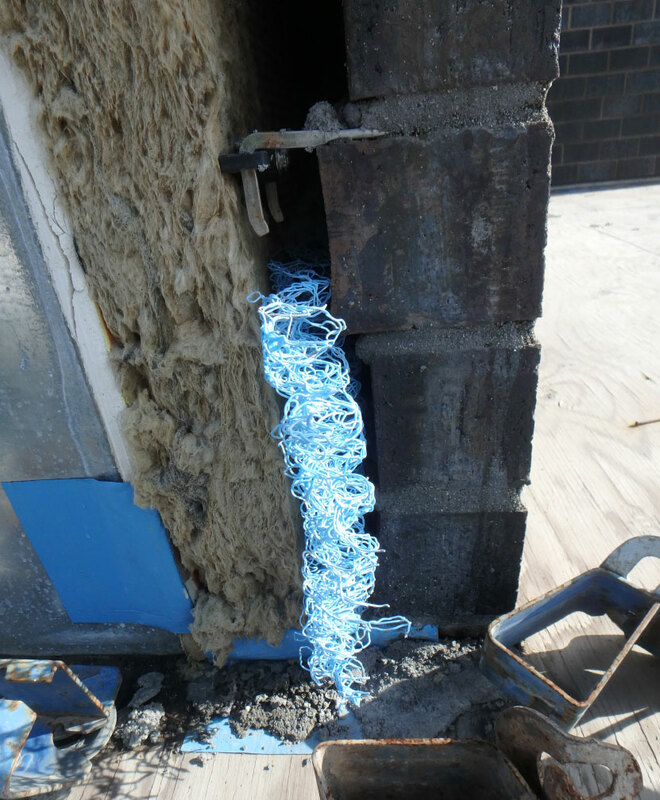 The semi- rigid properties of the insulation allow it to fit tightly around penetrations such as masonry veneer ties. Exterior insulation such as XPS or moisture-resistant polyisocyanurate may be appropriate when a Class I or II permeance air barrier and WRB system is used. Refer to the Insulation Products discussion on page i-30 for a discussion on various insulation types and additional considerations. Fig. 2-4 Double eye and pintle plate ties are attached through compatible self-adhered membrane patches over top of the fluid-applied air and water-resistive barrier. Ties penetrate the continuous rigid insulation. Fig. 2-5 Semi-rigid mineral fiber insulation with thermally optimized masonry ties. Although masonry is defined as a noncombustible cladding material, the use of a combustible air barrier and WRB system or foam plastic insulation within a wall cavity can trigger fire propagation considerations and requirements. Depending on the local jurisdiction, IBC Section 1403.51 regarding vertical and lateral flame propagation as it relates to a combustible WRB system may require acceptance criteria for NFPA 285.2 The use of foam plastic insulation within a wall cavity should also be addressed for IBC Chapter 26 provisions. Exterior sheathing on this system is typically a gypsum-based product and should be a product resistant to organic growth and moisture. Fiberglass-faced products are commonly used; avoid paper face products. 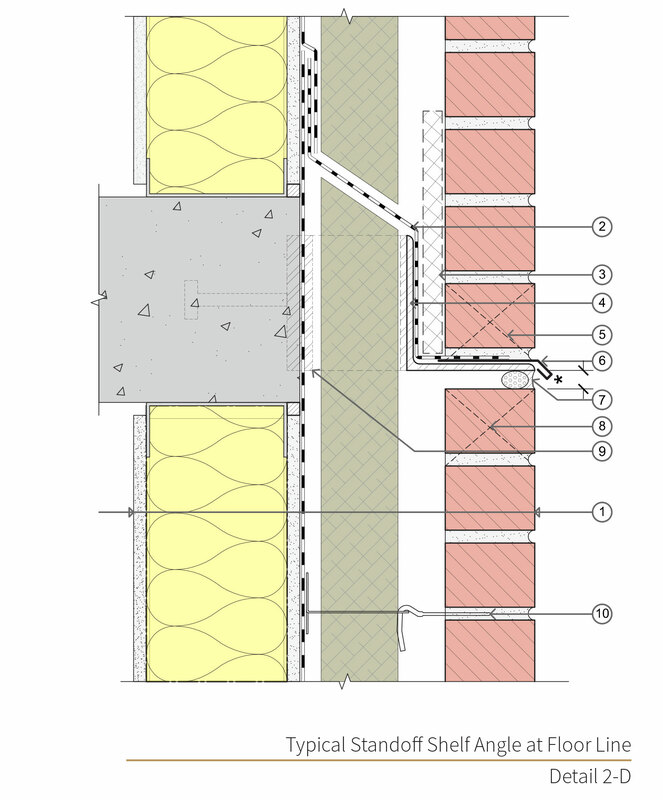 In this system, the air cavity between the anchored masonry veneer and the exterior insulation provides drainage behind the cladding and also ventilation when vent ports are provided at the top and bottom of the air cavity. The code- minimum air cavity depth is 1-inch, as required per TMS 402-16;6 however, the risk that mortar droppings will block the air cavity is increased with smaller cavities. A 1-inch cavity may be considered where a strict quality control program is implemented to minimize the risk that mortar droppings will block the cavity; however, a 2-inch air cavity is best practice. Fig. 2-18 demonstrates a typical rainscreen cavity for this system. The air cavity is ventilated through vents located at the top and bottom coursing of each wall section. Top vents typically occur just below parapet blocking and below intermittent bearing elements such as floor-line shelf angles. Bottom vents, which also serve as weeps and may be referred to as weep/vents, also assist with draining moisture within the air cavity. These weep/vents are typically located just above bearing elements such as loose-lintels, floor line shelf-angles, or foundation walls. Vents and weep/vents are recommended to be spaced a maximum of 24-inches on-center (e.g., every two to three masonry units) and filled with a cellular or mesh product that fills the head joint of a standard brick unit. It is important that weep fillers extend into the bed joint of the course to facilitate drainage. Avoid weep tubes because they provide far less ventilation and are blocked easily with debris. Use mortar collection nets at all veneer-bearing locations to prevent mortar from blocking the rainscreen cavity and weeps/vents. Generally, a trapezoidal open-weave, moisture- tolerant net is used. Sheet-metal components used with this system are reflected throughout the details at the end of this chapter. Cross-cavity sheet-metal components are typically located at all bearing elements such as penetration heads (e.g., window head), floor line shelf-angles, and foundations. These flashings assist with draining the rainscreen cavity and serve to protect fluid-applied or self-adhered flashing membranes that may exist beneath them. Counterflashing sheet-metal components assist with water shedding and are typically located at windowsill and parapet top conditions; they protect the cavity from water ingress while allowing ventilation of the air cavity. Fig. 2-19 on page 2-18 shows an example of sheet-metal components. Fig. 2-18 Mock-up wall section of System 2; thermally optimized screw ties penetrate the semi-rigid mineral fiber board exterior insulation. A mortar collection net is visible at the base of the air cavity. Fig. 2-19 A sheet-metal flashing conceals the top of the rainscreen air cavity and masonry at this windowsill area. The sheet-metal flashing extends beyond the masonry veneer face to deflect water away from the veneer. At the window jamb condition beyond, sheet-metal trim is also used to close off the rainscreen air cavity. For this system, anchored clay masonry will expand over time as a result of irreversible moisture gain, and mortar joints will shrink slightly over time. In the support system, the steel-framed backup wall will experience little volume change; however, some movement may occur where studs interface with floor and roof lines. To avoid veneer damage, breaks must be provided in the veneer to compensate for differential movement between the cladding and the support wall. Expansion joints must also be provided to allow for overall expansion of the clay masonry veneer; control joints must be provided for shrinkage where concrete masonry veneer units are used. Differential vertical movement between the structure and the veneer is accommodated with a horizontal gap between the veneer and elements that are directly attached to the wall structure, such as shelf angle supports, parapet blocking, and windows. Either a backer rod and sealant joint or cross-cavity sheet-metal flashing is placed at each horizontal gap. The size and location of joints will vary depending on the expected differential movement between the wall and veneer. Typical locations of joints for the purposes of accommodating movement, drainage, and/or rainscreen cavity ventilation are identified with an asterisk (*) in chapter details. In general, a minimum gap dimension of 3⁄8-inch is recommended; however, it is the Designer of Record’s responsibility to appropriately locate and size all movement joints. Fig. 2-20 Expansion joints (where indicated by red arrows) are located on this veneer where transitions occur at window steps and wall projections. Joints are continuous from the foundation-bearing element to the full height of the veneer. The steel frame walls and concrete floor slabs of this wall system provide the primary structure of this system. It is the responsibility of the Designer of Record to ensure that all structural elements of the backup wall and veneer are designed to meet project-specific loads and local governing building codes. Generic placement of the reinforced elements and supports/ties is demonstrated within the details of this chapter and is provided for diagrammatic purposes only. Masonry ties (i.e., masonry anchors) are used to connect the veneer to the steel- framed backup wall. They are designed to resist the out-of-plane loads applied to the wall, typically wind and seismic. At the same time, these ties must be flexible to allow the veneer to move in-plane relative to the metal stud–framed wall. Building codes provide prescriptive requirements for masonry ties secured to concrete or masonry that includes spacing, size, placement, and tie type. These requirements are summarized in Table 2-7 and are based on TMS 402-166 provisions for adjustable ties (i.e., anchors). Use of these prescriptive requirements is limited to masonry veneer assemblies with a weight less than 40 psf, with a cavity depth no more than 65⁄8-inches, and where the ASCE-77 wind velocity pressure (qz) is less than 55 psf (previously wind speed less than 130 mph). Wall assemblies that exceed these criteria require the design professional to evaluate the building loads and materials and rationally design the anchorage system accordingly. 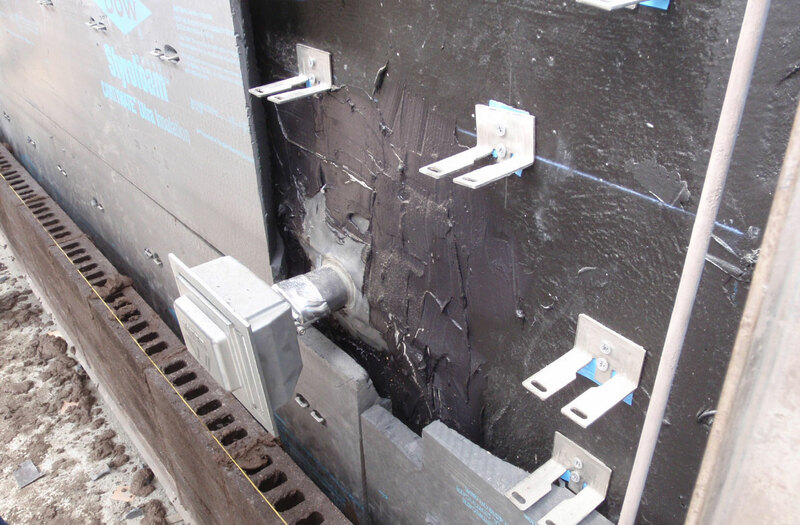 The majority of masonry tie manufacturers have empirical testing data available to support the use of their anchorage systems when the cavity depth or loads exceed these criteria. 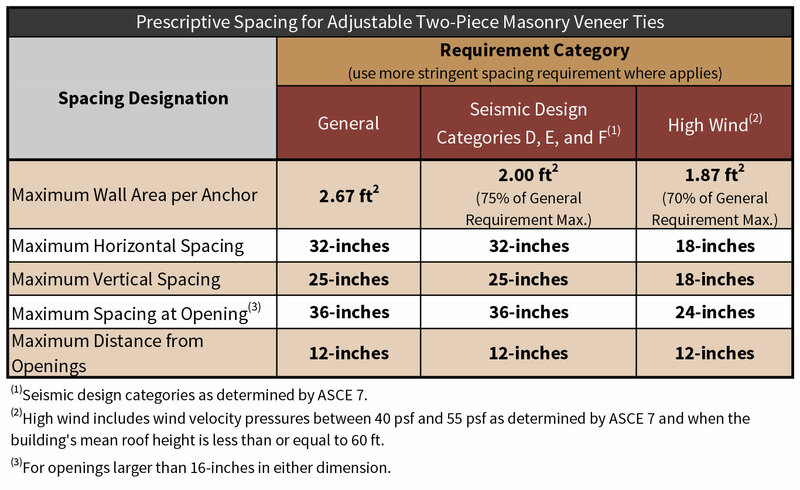 Prescriptive spacing requirements for anchored masonry veneers are included in Table 2-7 for special requirements for Seismic Design Categories D, E, and F and high-wind zones with velocity pressures (qz) between 40 and 55 psf. These higher seismicity and wind speed areas are common to some parts of the Northwest and are dependent on the geography and building occupancy category. Refer to local building code requirements to ensure seismicity and wind speed criteria are properly evaluated for the building occupancy and site conditions. Common tie types for reference are shown in Fig. 2-21. For steel-stud framed walls, adjustable ties are required by the code. Adjustable L-bracket triangular wire ties are acceptable but may not be preferred by installers because the vertical tie orientation can complicate exterior insulation installation by requiring vertical orientation of insulation boards. Corrugated masonry ties and nonadjustable surface-mounted ties are not allowed by TMS 402-166 for this system. To prevent pull-out or push-through of the tie, TMS 402-166 requires ties be embedded a minimum of 11⁄2-inches into the veneer, with at least 5⁄8-inch mortar or grout cover at the outside face. The mortar bed thickness is to be at least twice the thickness of the tie. To prevent excess movement between connecting parts of adjustable tie systems, the clearance between components is limited to a maximum 1⁄16-inch. The vertical o set of adjustable pintle-type ties may not exceed 11⁄4-inches. TMS 402-166 requires that masonry ties are fastened directly to the steel stud framing through the exterior sheathing with minimum #10 corrosion-resistant screws (0.190-inch shank diameter). They should not be fastened to the sheathing alone. While the code may allow a horizontal anchor spacing up to 32-inches on-center, it is recommended that anchors be spaced horizontally to align with the typical stud spacing, typically 16-inches on-center. Anchored masonry veneers are supported vertically by the building’s foundation or other structural components such as shelf angles and lintels. Vertical supports are designed to minimize cracking and deflection within the veneer; the support design considers the design loads, material type, moisture control, movement provisions, and constructibility. For steel stud-framed wall systems, TMS 402-166 requires the anchored masonry veneer to be supported by noncombustible construction; any veneer that exceeds 30 feet in height must be supported at each story above 30 feet. 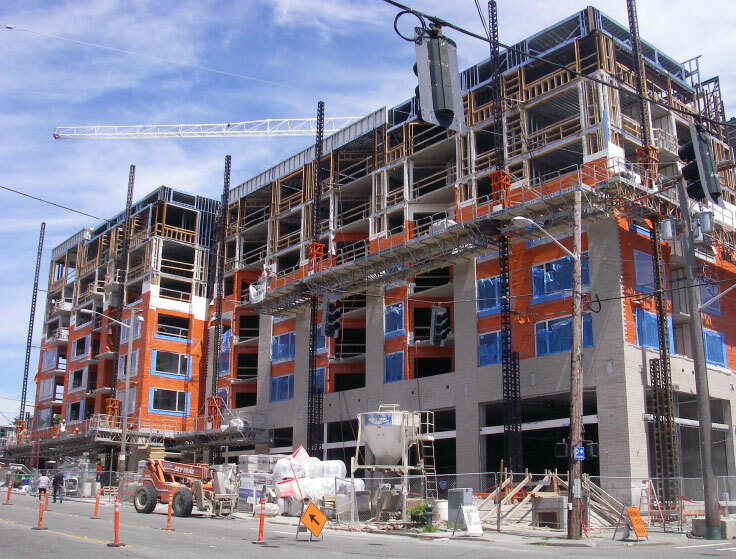 Masonry below 30 feet in height must also be supported at each floor when used in Seismic Design Categories D, E, and F. Best practice for commercial construction is to support the lowest portion of the masonry cladding directly on the concrete foundation wall. This guide recommends that intermediate supports for masonry are provided with galvanized-steel shelf angles anchored to the structure as needed to limit deflection to less than L/600 as required by TMS 402-16.6 As noted in the Movement Joints sections in this chapter and the introductory chapter, a joint is recommended beneath the angle and closed o from the rainscreen cavity with elastomeric sealant. Where masonry is supported at openings within the veneer (e.g., windows and doors), shelf angles for larger openings or loose lintels at smaller openings are typically provided. Galvanized-steel loose lintels are recommended except where architectural design dictates reinforced masonry or precast concrete lintels for appearance. Steel angle lintels span the opening; TMS 402-166 requires the lintel bear a minimum of 4-inches onto the adjacent masonry at the jambs of the opening. An example of lintel supports is shown in Fig. 2-22. Fig. 2-21 Masonry veneer tie types. Top row, left to right: standard double eye and pintle plate tie and thermally optimized double eye and pintle screw tie. 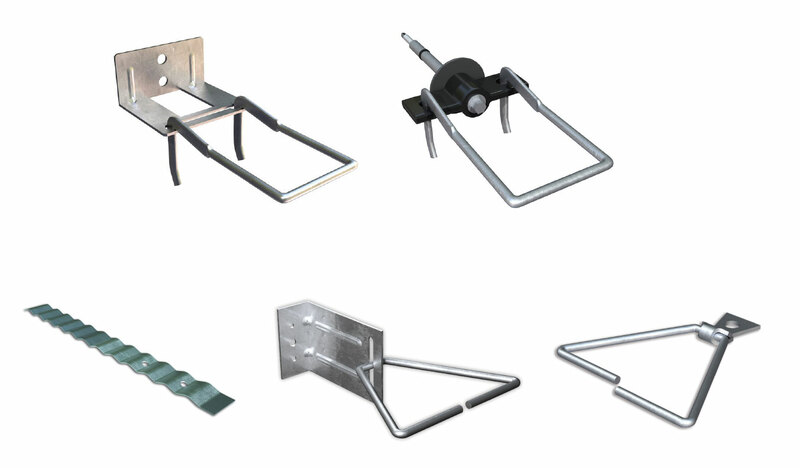 Bottom row, left to right: corrugated masonry ties, adjustable L-bracket, non-adjustable surface-mounted tie. Fig. 2-22 Loose lintel supports (with a sheet-metal flashing) occur at small window head conditions on this elevation. It is best practice to match the durability and longevity of metal components within this system to that expected of the masonry veneer. Metal components within this system include veneer ties, vertical support ledgers and lintels, sheet-metal flashings, and fasteners. This guide includes discussion for common corrosion- resistant materials; however, it is the Designer of Records’ responsibility to appropriate select a level of corrosion resistance for project-specific application/ exposure and the expected longevity of the masonry system. Best practice is to use sheet-metal flashing components of ASTM A66611 Type 304 or 316 stainless steel, which is nonstaining and resistant to the alkaline content of mortar materials. Whereas the use of stainless steel sheet-metal flashing components is not always economically feasible or aesthetically desirable, prefinishing sheet-metal may be considered. Where used, this guide recommends the base sheet metal is a minimum G90 hot-dipped galvanized coating in conformance with ASTM A65312 or minimum AZ50 galvalume coating in conformance with ASTM A792.13 Coating the exposed top finish of the sheet metal with an architectural-grade coating conforming to AAMA 62114 is recommended. Appropriate product selection of masonry veneer unit and mortar materials is necessary to provide a durable and water-resistive cladding system. The masonry veneer units and mortar joints should also be installed in conformance with industry standard best practices and manufacturer requirements. The specifics of architectural characteristics and structural properties of the masonry veneer units, mortar, and reinforcing should be designed and reviewed by a qualified Designer of Record. Air and water control layer continuity is provided by the self-adhered sheet- or fluid-applied air barrier and WRB field membrane, prestrip membrane, and air barrier sealant transition to the window. Window strap anchors are bed in sealant during fastening to eliminate an air barrier discontinuity behind the strap anchor that could otherwise lead to both air leakage and/or water intrusion. 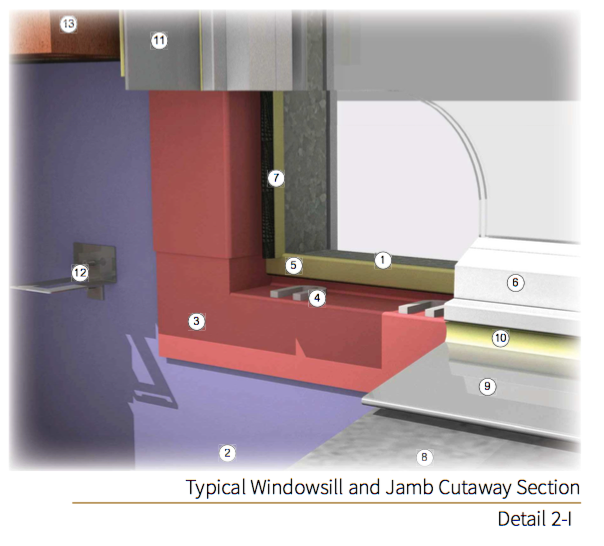 A non-flanged window is shown in Detail 2-A and facilitates future window repair and replacement without the need to remove the anchored masonry veneer. The hot-dipped galvanized-steel loose lintel location allows the exterior insulation to be continuous up to the rough opening. The two-piece sheet-metal flashing may be replaced with a self-adhered flashing membrane for a thermal improvement, as shown similarly in Fig. i-31 on page i-47. Where replaced, the self-adhered flashing membrane should be compatible with the air barrier and WRB system. Also see Detail 2-D for an example of this detail approach. Air and water control layer continuity is provided by the self-adhered sheet- or fluid-applied air barrier and WRB field membrane, self-adhered sheet- or fluid-applied flashing membrane at the sill, and the air barrier sealant transition to the window. The sheet-metal sill flashing conceals the rainscreen cavity; counterflash each end dam of the sill flashing with the sheet-metal jamb trim to close o the rainscreen cavity and complete the water- shedding surface. Sheet-metal jamb trim, attached to intermittent L-angles at window per manufacturer recommendations. Counterflash sheet-metal sill flashing end dams (beyond). Bed sheet-metal trim in sealant at anchored masonry veneer return. Air and water control layer continuity is provided by the self-adhered sheet- or fluid-applied air barrier and WRB field membrane, prestrip membrane, and air barrier sealant transition to the window. Window strap anchors are bed in sealant during fastening to eliminate a discontinuity in the control layers behind the strap anchor that could otherwise lead to both air leakage and/or water intrusion. This detail allows the exterior insulation to continue up to the rough opening. The sheet-metal attachment to the intermittent angle, exterior of the window’s thermal break, improves thermal performance of the jamb condition. Self-adhered or fluid-applied flashing membrane, extend onto intermittent knife plate. See Fig. i-40 and Fig. i-41 on page i-57 of the introductory chapter for additional detailing discussion. * Size joint for project-specific movement, minimum 3/8-inch. A self-adhered flashing membrane over the semi-rigid insulation provides drainage of the rainscreen cavity at the floor line. It is a thermally improved alternative detail to a two-piece sheet-metal flashing as shown similar in Detail 2-A. When installing the self-adhered membrane, provide a tight fit to the substrate and slope to drain. 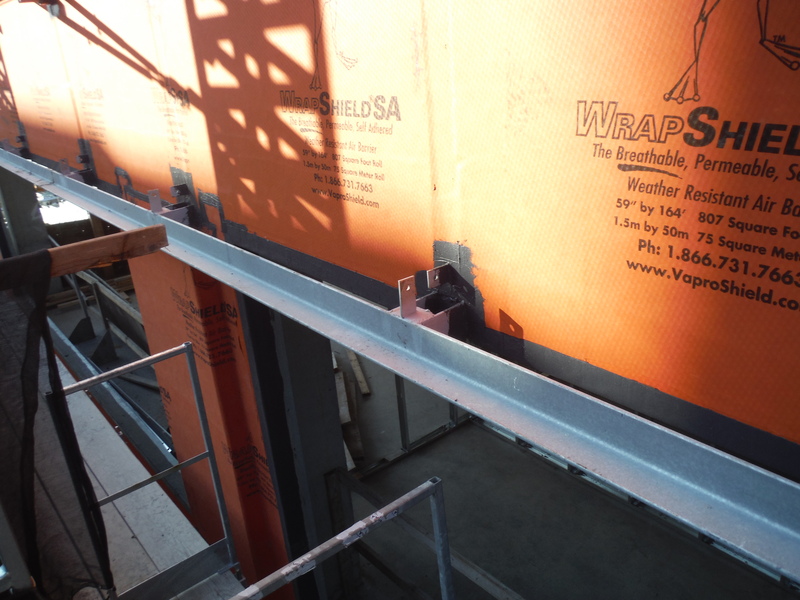 The hot-dipped galvanized-steel standoff shelf angle support reduces the amount of thermal bridging at the floor line when compared to a continuous shelf angle mounted tight to the concrete slab face. Refer to Fig. i-31 on page i-47 for an alternative lip brick detail that reduces the visibility of the backer rod and sealant movement joint. Note, this joint is necessary for differential movement that will occur between the structure and anchored masonry veneer. * Size gap for project-specific movement, minimum 3/8-inch wide. The concrete roof structure provides the vapor control layer at this detail. Parapet cavity insulation provides continuity of the thermal control layer at the roof-to-wall transition. The standoff shelf angle support at this transition allows for continuous thermal insulation to occur between the roof and wall assemblies. Use of a lip brick at the wall base hides the sheet-metal counterflashing. Masonry wall system installation o en precedes roof membrane installation and restricts future access for installation of the roof membrane and flashing components behind the standoff shelf angle support. As a result, installation of a roof membrane prestrip and roof penetration flashing membrane at the concrete wall is needed prior to masonry wall system installation. Three-dimensional cutaway sections on the next four pages represent two-dimensional details of this system. In all details, water control layer elements are shingle-lapped to encourage drainage in the rainscreen cavity. As shown in Detail 2-F, horizontally oriented ties, such as a double eye and pintle plate tie, allow exterior insulation to be installed in horizontal strips between ties. 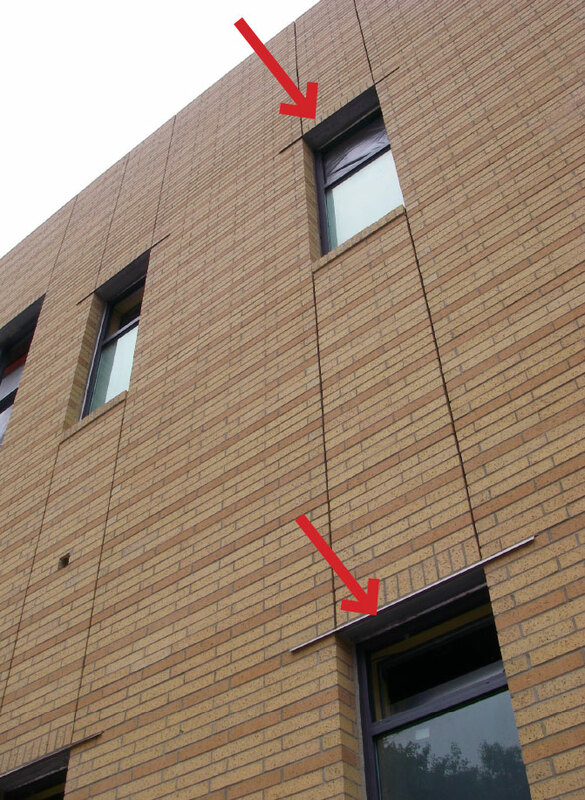 This orientation can improve the efficiency of the anchored masonry veneer installation. 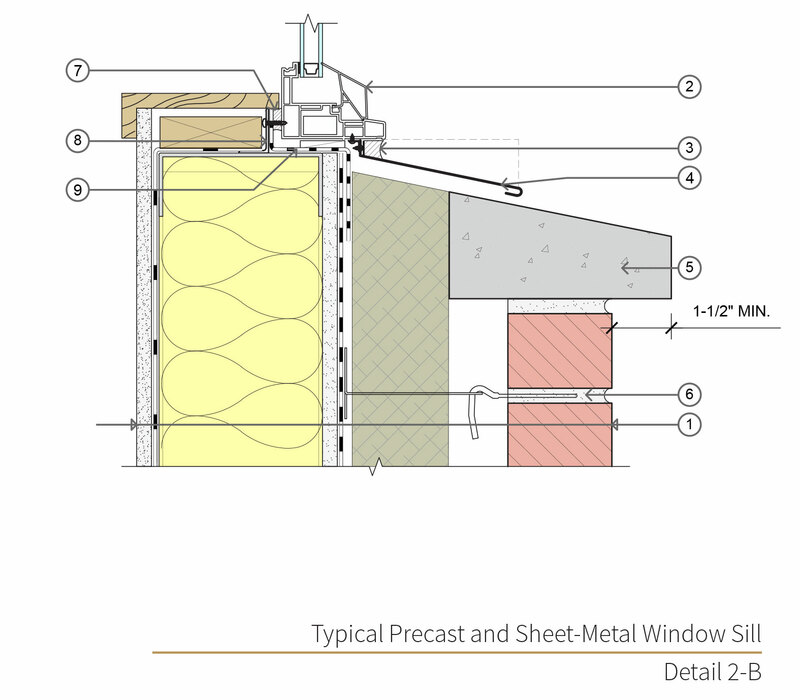 The two-piece sheet-metal flashing at the window head, as shown in Detail 2-F, allows the upper flashing to be installed and integrated into the air barrier and WRB system prior to installation of the lower sheet-metal flashing and hot-dipped galvanized-steel loose lintel. As shown, the sheet-metal flashing above the lintel ends at a head joint. This location allows the sheet-metal head flashing to terminate with an end dam. Weep/vents at the floor line above the lintel, as shown in Detail 2-G, provide both drainage and ventilation of the rainscreen cavity above. Mortar collection mesh helps keep the weeps and the base of the rainscreen cavity free of mortar droppings. Vents below the floor line lintel encourage ventilation of the rainscreen cavity. Detail 2-H describes a typical rough opening with sill back dam angle. 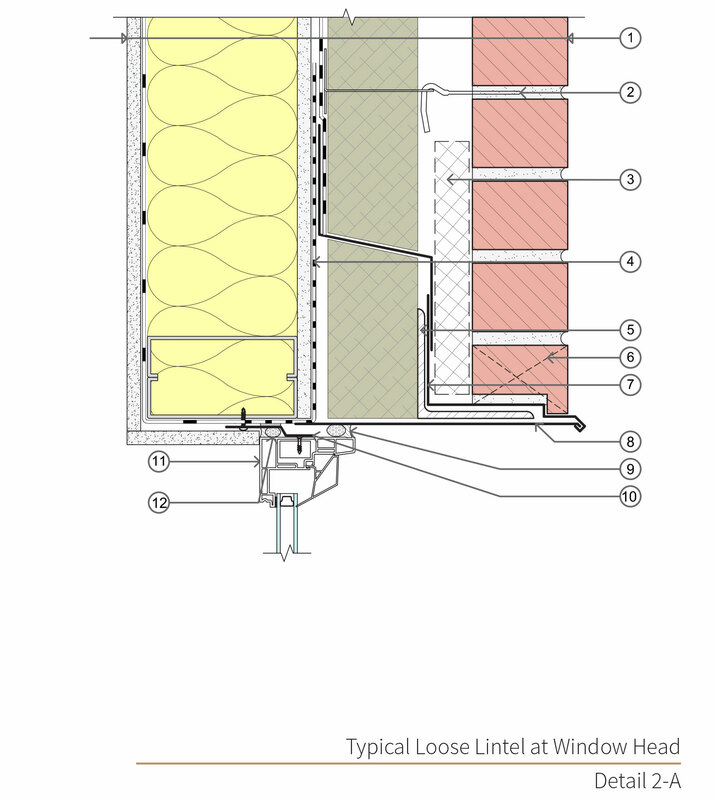 The back dam angle creates a sill pan below the window; intermittent shims below the window promote drainage at the sill and into the rainscreen cavity. The saddle flashing in this detail is o en a fluid-applied flashing membrane. A self-adhered saddle flashing membrane may be difficult to form continuously at the parapet-to-wall interface. 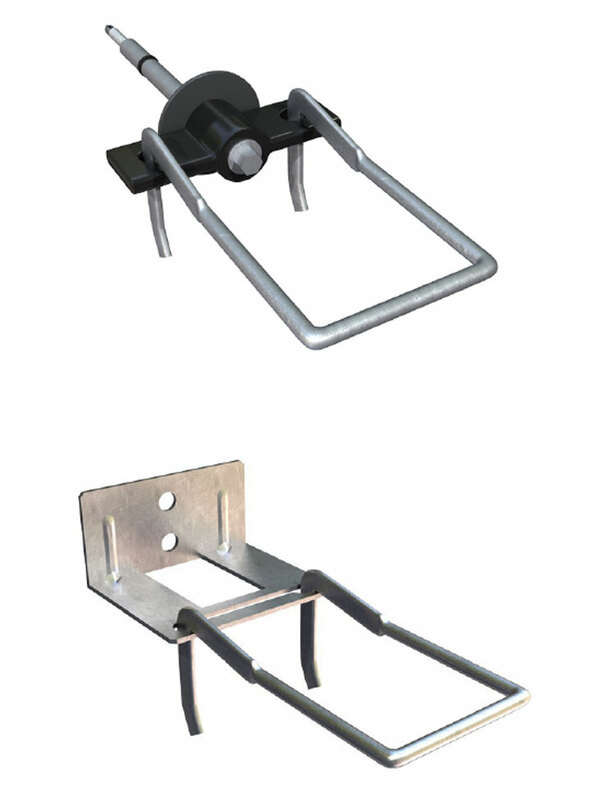 The hot-dipped galvanized-steel standoff shelf angle support is shown anchored on intermittent knife plates; however, other standoff support options may be used. Welding activities necessary to attach the ledger to the support can damage waterproofing. Protect waterproofing during welding activities or sequence waterproofing components following ledger installation if accessibility and clearance allow. The ledger is located above the parapet blocking. The separation between the blocking and ledger is sized to accommodate any anticipated building movement during construction or occupancy. The sloped parapet below the ledger encourages drainage of water away from the parapet saddle transition. 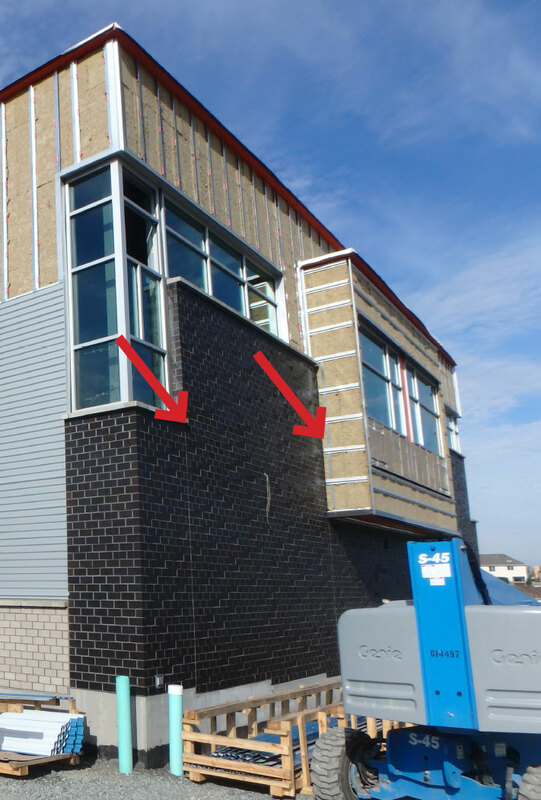 The standing-seam sheet-metal coping is end-dammed at the anchored masonry veneer face and deflects water away from the parapet saddle transitions. The anchored masonry veneer transitions to Detail 2-D at the outside wall corner. An end dam is recommended where Detail 2-D terminates at the parapet. Refer to Detail 3-K in Chapter 3 for a similar cutaway section at the exterior parapet face. For cavity insulation, steel stud walls are typically constructed with 16-inch on- center stud spacing and can accommodate up to an R-15 batt insulation for 3-5/8- inch studs or R-21 batt insulation for 6-inch studs. Alternative insulation products may also be used to fill the cavity. Because of its high thermal conductivity, steel framing can reduce the nominal R-value of the stud cavity insulation by approximately 40 to 60%. For this reason, continuous insulation is typically needed to meet prescriptive energy code compliance strategies. 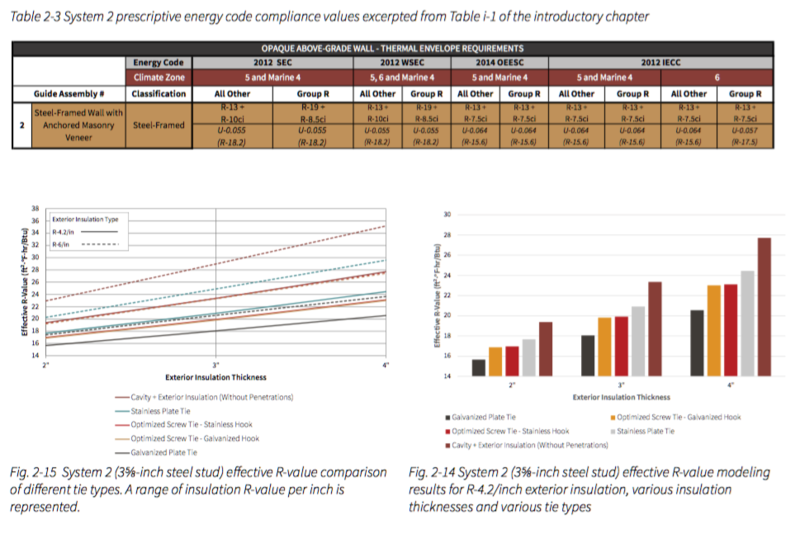 For all energy code compliance strategies except the prescriptive insulation R-value method strategy, the system’s thermal performance will need to be determined as a U-factor either through calculation or from tables; however, it may or may not be required to be less than the prescriptive U-factors shown in Table 2-3 on page 2-13. The Thermal Performance and Energy Code Compliance discussion on page i-33 and Fig. i-26 on page i-39 of the introductory chapter describes the typical process of navigating energy code compliance options. Additionally, the thermal modeling results demonstrated in this chapter may be used to assist with selecting wall system components (e.g., tie type, insulation R-value/inch, etc.) to achieve a target U-factor. 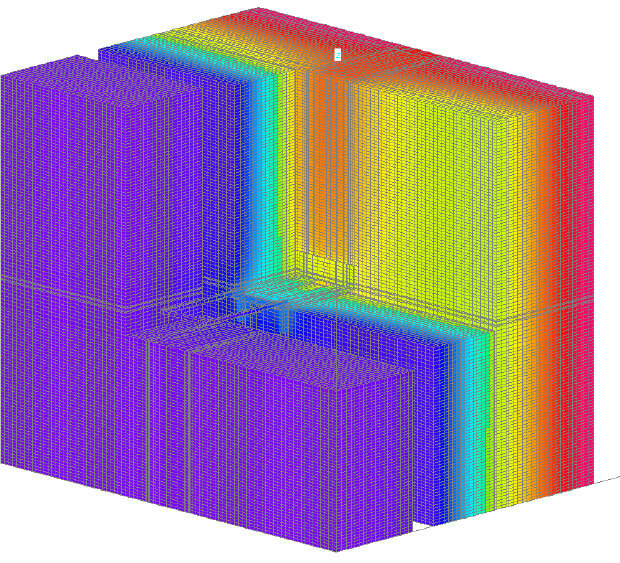 Options for thermally optimizing this system, as determined through the modeling results, are also discussed. 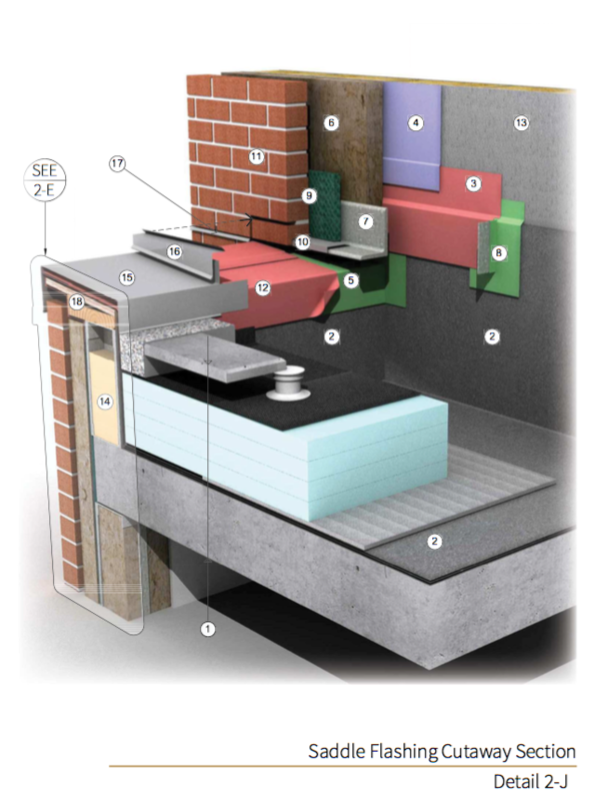 Masonry ties and floorline shelf angles penetrate the exterior insulation in this system and create areas of thermal bridging; thermal bridging reduces the system’s actual thermal performance. Examples of typical anchored masonry veneer ties and a standoff shelf angle support are shown in Fig. 2-6 and Fig. 2-7; the relative thermal bridging that these components can have when penetrating exterior insulation is illustrated in Fig. 2-8 through Fig. 2-13 on page 2-10. Where shown in Fig. 2-9, Fig. 2-11, and Fig. 2-13 the lighter blue thermal gradient color at the attachment describes a warmer temperature than the adjacent darker blue insulation face, which is an indicator of heat loss at the penetration through the insulation. 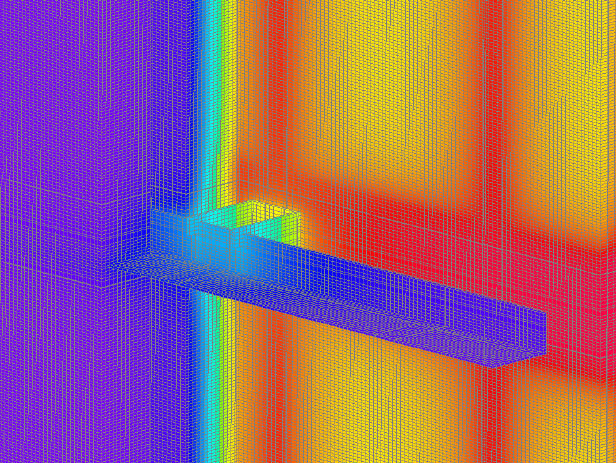 Thermal bridging of the steel studs and concrete slabs are also depicted where the thermal gradient is orange (warmer) at studs and transitions to yellow (cooler) where cavity insulation occurs. This thermal bridging reduces the system’s effective thermal performance. Framing and Cavity Insulation: 35⁄8-inch steel stud wall with R-15 batt insulation or 6-inch steel stud with R-21 batt insulation. 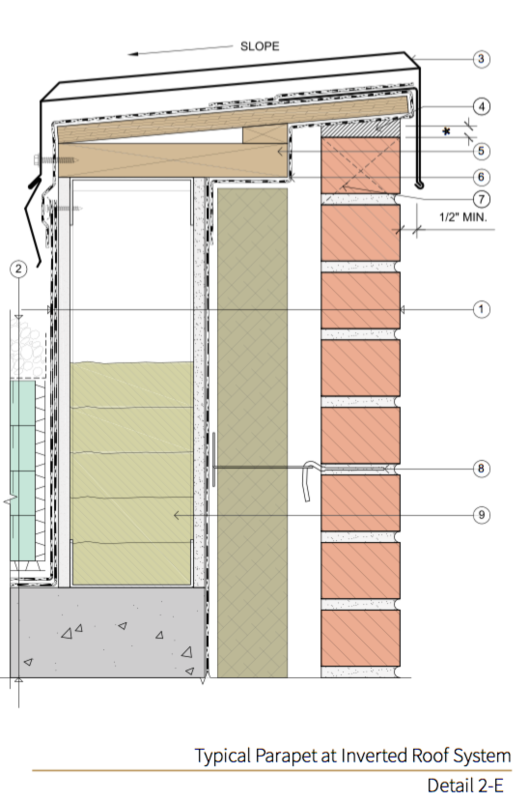 A full-height steel stud wall includes the top and bottom track adjacent to a concrete slab but does not include the wall area at the slab edge. Exterior Insulation: R-4.2/inch or R-6/inch insulation product. Insulation thicknesses of 2-, 3-, and 4-inches are considered. The R-values selected demonstrate the lower and upper thermal resistance of typical exterior insulation products. 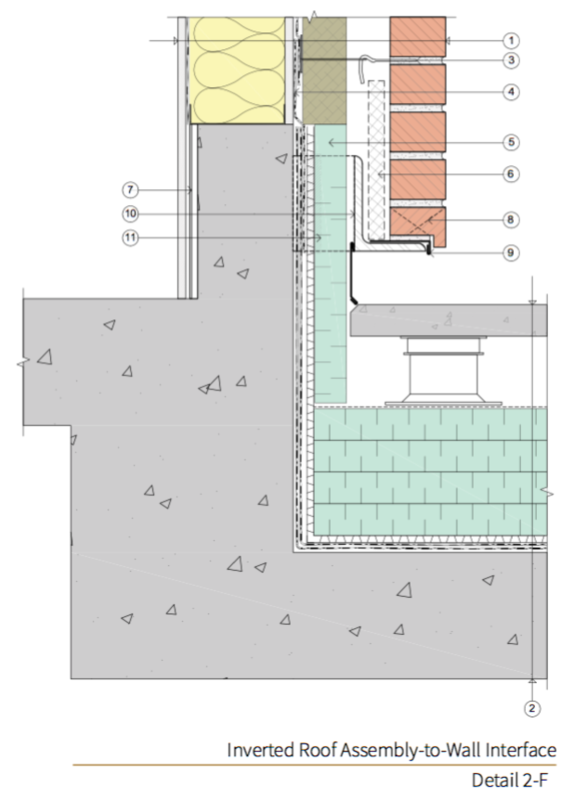 Shelf Angle Supports: For energy code compliance purposes, the peripheral concrete slab edges that typically occur on a building with this system are classified as a mass above-grade wall; opaque mass wall thermal envelope requirements may be found in tables within Chapters 1, 4, 5, and 6. 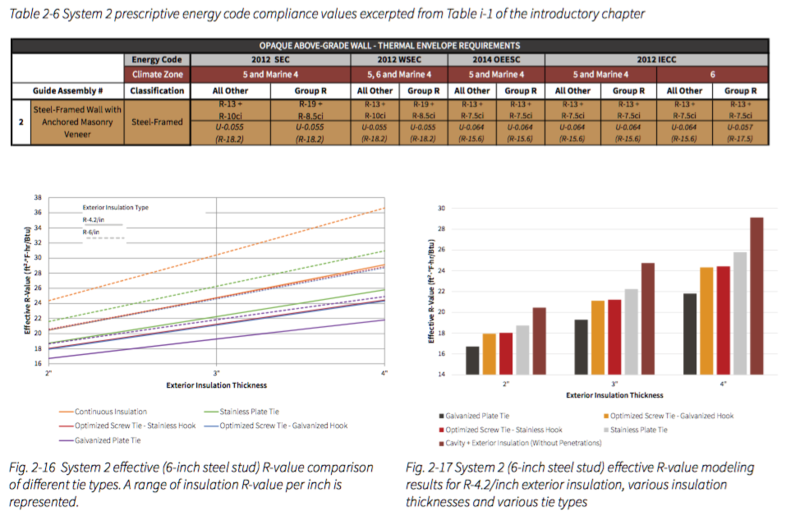 As a result, the influence the slab edge has on the steel stud system’s effective R-value is not included within the system modeling results but is presented separately. Shelf angle supports are either attached tight to the floor line structure (i.e., continuous shelf angle) as shown in Fig. 2-10 and Fig. 2-11 or offset to the depth of the exterior insulation and supported by intermittent hollow steel sections (HSS) at 4 feet on-center (i.e., standoff shelf angle) as shown similar in Fig. 2-12 and Fig. 2-13. Slab edge modeling results consider the effects of the steel stud system above and below. Modeling results are shown in Table 2-1, Table 2-2, Fig. 2-14, and Fig. 2-15 (see page 2-12 and page 2-13) for 35/8-inch steel stud walls and Table 2-4, Table 2-5, Fig. 2-16, and Fig. 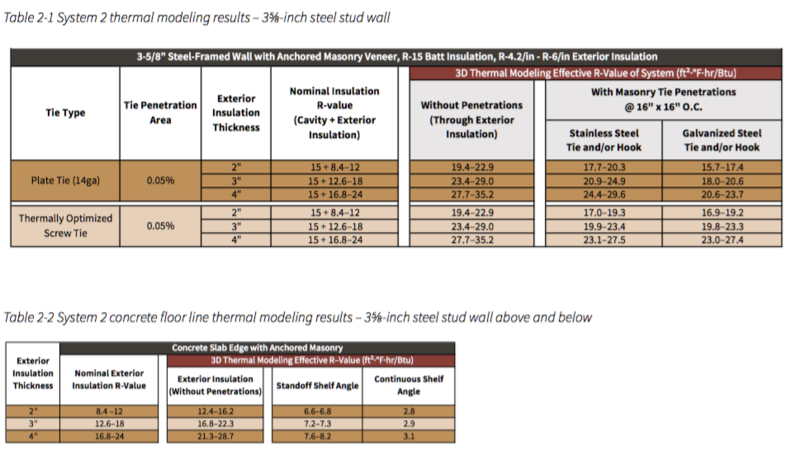 2-17 (see page 2-14 and page 2-15) for 6-inch steel stud walls demonstrate the system’s effective R-value. Figure references graphically represent the results summarized in each table. As determined from Table 2-1 and Table 2-4, the system’s effective R-value is reduced by 9 to 33% when considering tie penetrations. Note that a 16-inch by 16-inch on-center spacing is modeled for this guide; reducing the frequency of ties can increase the system effective R-value; however, spacing needs to be coordinated with structural requirements. As determined from Table 2-1 and Table 2-4, stainless-steel plate ties reduce the system’s effective R-value by 8 to 16%, while galvanized-steel plate ties reduce the effective R-value by 18 to 33%. Stainless-steel plate ties reduce the effective R-value less than both galvanized-steel and thermally optimized tie options as shown in Fig. 2-14 through Fig. 2-17. Use of a stainless-steel plate tie may prove to be a cost-effective option compared to thermally improved proprietary tie options and also provides a highly corrosion-resistant attachment method. As determined from Fig. 2-15, an R-24 target could be provided by one of the scenarios listed below when using R-6/inch exterior insulation. As a result, the tie used can effect the wall thickness without compromising the system’s effective R-value. – 4-inches of insulation with a galvanized-steel plate tie. 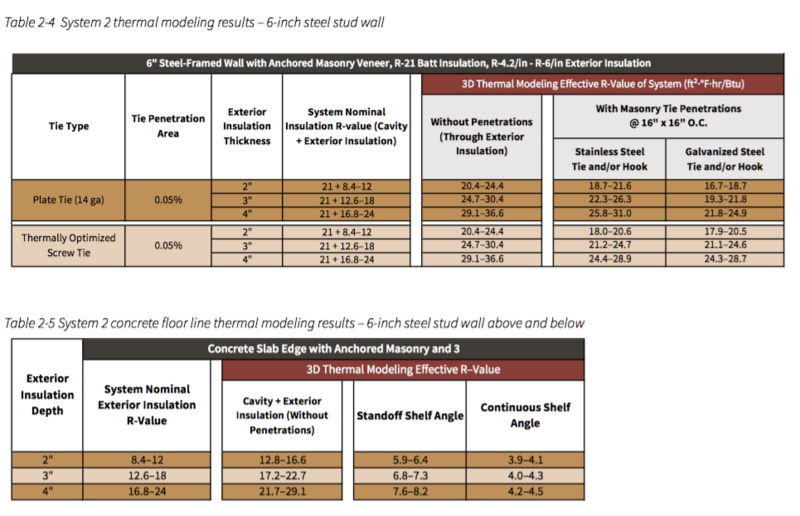 Table 2-2 and Table 2-5 demonstrate the effective R-value of exterior insulation at two shelf angle options: standoff and continuous. As shown, a continuous shelf angle provides a lower effective R-value than a standoff shelf angle. When compared to the effective R-value of the slab edge without a shelf-angle, the system’s effective R-value is reduced by 70 to 89% with a continuous shelf angle and 47 to 72% with a standoff shelf angle. When shelf angle supports are needed for this system, a standoff angle will provide a greater effective R-value at the slab edge condition. Fig. 2-7 Brick tie types used for modeling—from top to bottom: thermally optimized screw tie and double eye and pintle plate tie. Fig. 2-8 Three-dimensional section of a galvanized steel masonry tie through exterior insulation. Fig. 2-9 Three-dimensional thermal image of the galvanized steel masonry tie depicted in Fig. 2-8. Fig. 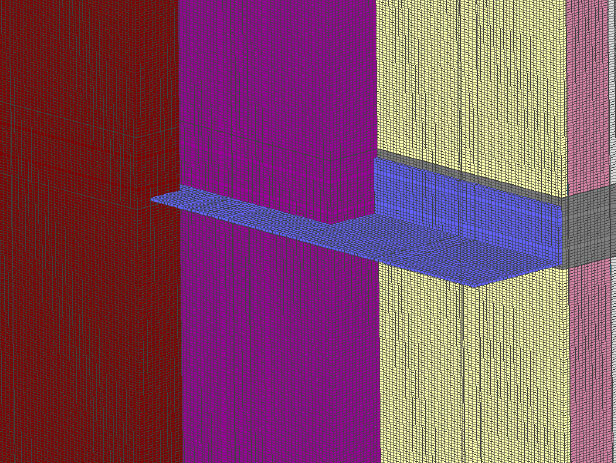 2-10 Three-dimensional section of a continuous floor line shelf angle supporting anchored masonry veneer. Fig. 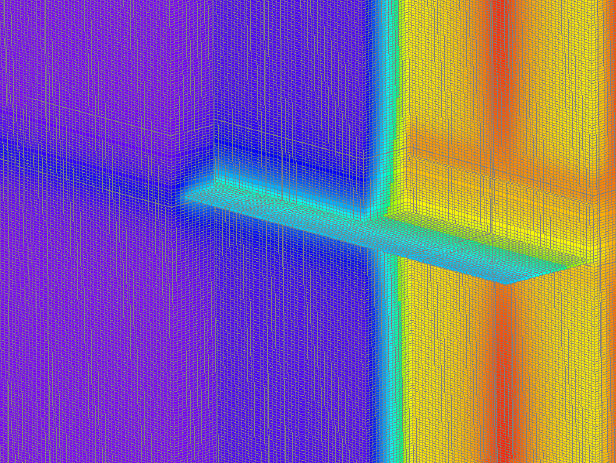 2-11 Three-dimensional thermal image of the continuous floor line shelf angle shown in Fig. 2-10. Fig. 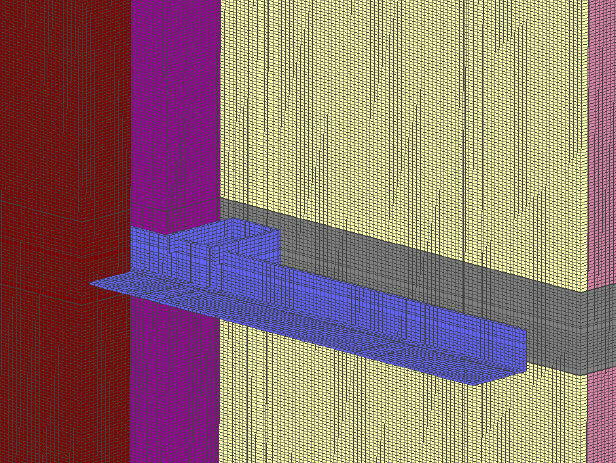 2-12 Three-dimensional section of a standoff floor line shelf angle supporting anchored masonry veneer. Fig. 2-13 Three-dimensional thermal image of the standoff floor line shelf angle shown in Fig. 2-12. 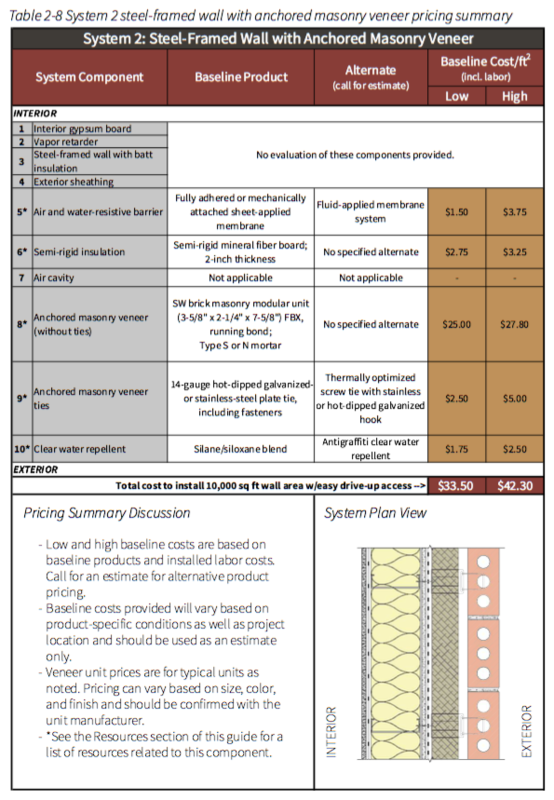 A pricing summary for this system is provided on Table 2-8 on page 2-27. Pricing demonstrates the relative price per square foot and is based on a 10,000-square- foot wall area with easy drive-up access. Pricing includes all components outboard of the exterior wall sheathing and provides no evaluation for interior finishes (including vapor retarder), framing/sheathing, or cavity insulation. Pricing is valid for the 2018 calendar year. Current pricing is also available at www. masonrysystemsguide.com.